Preparing a child or teen with chronic illness or medical complexities for back to school poses a unique level of anxiety and challenges. Worrying about how the school year will go for their health, whether the teachers and school will accommodate their needs, and if they will enjoy a satisfying social outlet like other children. I stressed about every detail for my son with Crohn’s Disease who struggled with pain, nausea, energy, and medical complications. He needs to miss school regularly for doctors appointments, infusions given at our children’s hospital, flares of the disease, or being vulnerable to catching random illnesses from having a compromised immune system. We are fortunate that we are in a top quality, supportive public school district. However, after my son missed most of 8th grade, it was beyond challenging working out the best way and level of support for him to ease back into the school environment for 9th grade. He kept having new issues and setbacks compounded by going through an angry, frustrated stage coping with his challenges. Advocating for the right type of interventionist and familiarizing staff with my son’s illnesses were my priorities amidst coping with his continuing medical problems. Mid-school year he needed emergency orthopedic surgery with a long recovery, so we finished the school year with online courses. Unfortunately the online courses our school system used from an outside vendor were boring and had errors, making it a frustrating experience. I gradually learned how to advocate for him, help staff understand his unique needs, and ensure the right people came together to figure out how best to support him. Figuring out how much to push vs. compromise, to listen well and think through the perspectives, helped me seek out creative approaches. Thankfully this past school year my son was back in school full time, had a wonderful interventionist and the right accommodations and support. Along with improved healing and health, he readjusted and flourished in school. Even in the best of circumstances there are endless moving parts to ensure as smooth a school year as possible. In the United States children with chronic illness or medical complexities are usually covered under the Americans with Disabilities Act and can get a 504 plan for school to protect their needs. However, I hear many stories from parents about their school districts not understanding, especially when it comes to invisible disabilities or ones the school staff may not be familiar with. I will be writing more about that school advocacy journey and the process of helping my son readjust to school after being out of school with such long hospitalizations. Gradually transition them to similar schedule as they will have in school starting a week or two ahead, especially for waking and bedtime. Talk with your child about the new school year, asking open ended questions that encourage them to express any concerns. If they see a psychologist, it can be helpful to plan an appointment or two in the weeks before school starts. Ask the therapist if they have any suggestions for how you can ease the transition back to school. Discuss what kinds of lunches they’d like to bring or if they want to buy lunch. For example, my son has dietary restrictions that require some advanced thinking through. I wanted his buy in to make sure he would like what I bought or prepared. Plan a visit to school collaborating with staff about best timing so they can see their classroom(s), plan their route to different locations, and meet teachers and other key staff. For younger children visit the school playground. Children with chronic illness who missed a lot of school may be anxious about how to handle questions from their school friends about why they were out. We found it helpful to role play some simple, short answers. Same for if they have special medical equipment that they’re uncomfortable about explaining. My son uses a crutch for a longer term complication. He wasn’t sure how to answer the awkward assumptions people made that it must be for a sprain or a fracture and didn’t want to share why he needs it. We helped him brainstorm some quick answers and ways to change the subject. Discuss concerns and brainstorm ideas with other parents of children with the same chronic illness as yours. There are many wonderful online forums and Facebook Groups for parents of children/teens with various chronic illnesses that can be great support systems. Talk to school staff as early as possible about your child’s needs. For newly diagnosed children, you can ask who at your school district you should meet with to set up a 504 plan for your child. Many medical nonprofits have useful information and templates to help you prepare for your first 504. For example, the Crohn’s and Colitis Foundation has great information including this school accommodations fact sheet and the Crohn’s and Ulcerative Colitis Guide for Teachers and Other School Personnel. Part of this process is ensuring school staff understand what your child’s chronic illness entails and how it may impact their functioning at school. If your school is not meeting your child’s accommodation needs, don’t hesitate to go a level above the staff person you have been assigned. It is important to have a positive partnership with school and some compromise might be needed so l try to listen carefully to the school staff perspective. However, follow your gut and consider your options if you’re not satisfied with what you are hearing. Health and safety concerns are always my first priority as does anything that would embarrass my child. For example, if your child has a condition where they must have immediate access to a bathroom or fear having an accident, that isn’t negotiable. 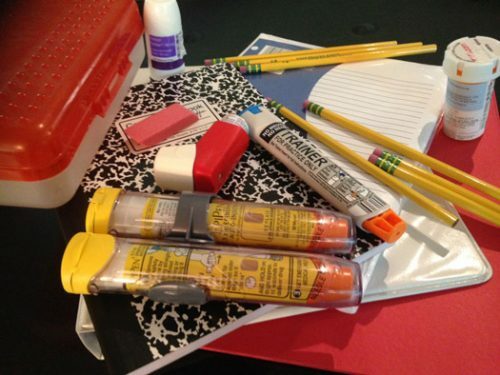 Prepare early for getting all the school forms completed, especially medical forms, permission slips to administer medications, and if applicable asthma or allergy action forms. I plan appointments with my son’s specialists and infusions close to when school starts to minimize his missing school at the beginning weeks of school. I bring those forms, requests for letters, prescription refills, etc. with me to the doctor. Each year I ask my son’s main specialist to write a letter for school to update the staff on his condition, symptoms, issues to watch for, accommodations, and a short description of each of his conditions. I provide the specialist with last year’s letter with my input of what I hope she will include which we then discuss at his visit right before school starts. Her social worker helps complete it. Find out when it is best to bring in medications along with any paper medical forms (many school districts have moved to online forms). I like to check in with the school nurse and any staff who provide medications or tend to sick kids to ensure they understand the signs to watch for that are more routine vs. urgent. I verbally discuss it while also going over the written forms and instructions. Make sure that the medication expiration dates if possible are after the school year is over. Try to meet with teachers and key staff like interventionists before or as close to beginning of school as possible to help them understand your child’s condition and needs. I focus first on most essential information (i.e. medical needs that impact learning or classroom) via email first and then if possible in person since I know they are very busy at the start of school. Also discuss with school what extra interventionist and tutoring assistance is available especially if they are behind in school because of their chronic illnesses. Be prepared to complete forms and coach staff of any extracurriculars your child will do. Work with your child’s therapists on any goals you might have for them that might make the school transition easier. For example, the physical therapist might work on strength building or navigating stairs. An occupational therapist might help with tactics like isometric hand clasps or handling a small squeeze or weighted ball to help with sensory and fine motor issues. Wishing you all a wonderful new school year. What approaches do you use to prepare your children and school staff?